From despair to D'Spayre! 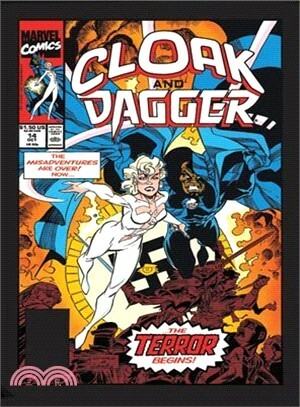 With Tyrone Johnson dead and buried, a blind and grief-stricken Dagger deals with the agony of loss - while the villainous Ecstasy wears Cloak's cloak! But rumors of Ty's death have been greatly exaggerated - does he have what it takes to reclaim his mantle? He'd better hope so, because when the Acts of Vengeance hit, our reunited duo will encounter the Avengers! Meanwhile, the evil Mr. Jip has been scheming for months - and his multifaceted plans will soon come to fruition! But what does Doctor Doom have to do with it? Plus, Spider-Man and Ghost Rider help Cloak and Dagger take on...Mephisto? And can our heroes cope with the demonic D'Spayre, who bears shocking revelations about their origins?